Battle the Warpriest (with a twist) for some fairly good rewards. 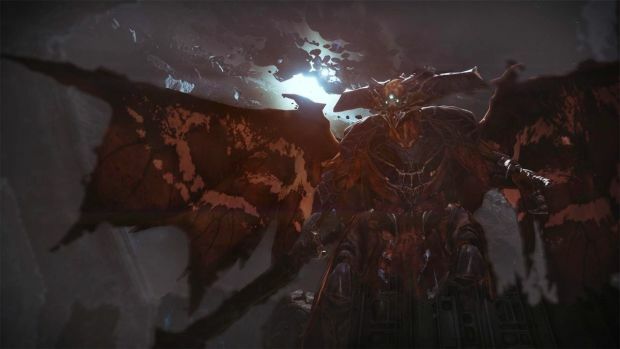 As per Bungie’s promise, the first challenge mode for Destiny: The Taken King’s raid King’s Fall has gone live and it’s for the Warpriest. Interestingly enough, it isn’t quite spelled out what you have to do but some erstwhile Reddit users have discovered the required steps. On the Warpriest, there are three different Glyphs that fireteam members must activate in a particular sequence to receive the Brand of the Initiate, which is required for damaging the boss. The person who steps on the last plate in the sequence is the one who gains the Brand. With the new challenge mode, there must be different Brand holders for the duration of the fight. That means you can’t have a designated Brand wielder and move him around the room. If you kill the Warpriest in two phases, then there must two different Brand wielders. Users reported 310 rewards on Normal Mode and 320 rewards on Heroic. The “Worm God’s Servant” emblem also drops along with a Calcified fragment. What are your thoughts on this challenge? Let us know in the comments.